How do Transformers and Jaegers compare? AskMen.com asked Guillermo Del Toro who would win between a Transformer and a Jaeger. The question is easy to answer. Jaegers are almost 10 times bigger. 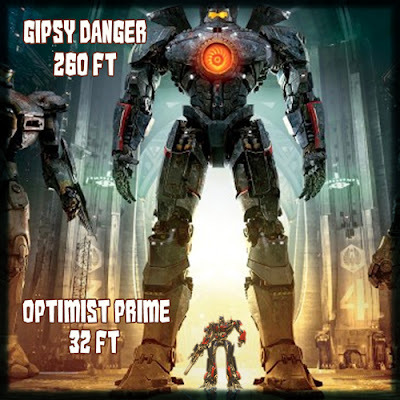 Even Devastator, the giant transformer that is a combination of six Decepticons is only 120 ft tall. Now for you nerds, there is Metroplex, in robot mode he is 698 ft. When transformed into city mode the Autobots use him as a fortress. But for the most part as Guillermo Del Toro explains, the scale is totally different. just to name a few: Unicron, Primus, and Fortress Maximus. Too late but i don't care. Unicron is as big as jupiter and most cersions of transformers >>> jeagers. Its not even close actually. Iirc one version of megatron/starscream combination was destroying the planet just by rising energon levels. Jeagers can only beat movie transformers.